The Kaito KA1107 is a dual conversion, analog display receiver that covers AM, FM and 10 shortwave bands: 3.75-4.25, 4.50-5.10, 5.90-6.40, 7.10-7.50, 9.35-9.95, 11.60-12.10, 13.50-13.90, 15.10-15.70, 17.50-17.90 and 21.40-21.90 MHz. There is a digital 12 hour clock with sleep timer (up to 119 minutes). 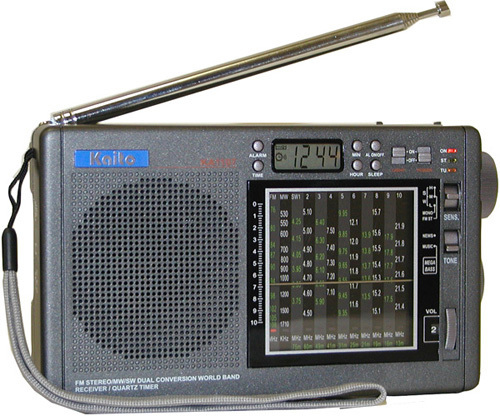 Other features include: sensitivity switch, tone switch, stereo/mono switch, external antenna jack and dial scale. Requires four AA cells (not supplied). 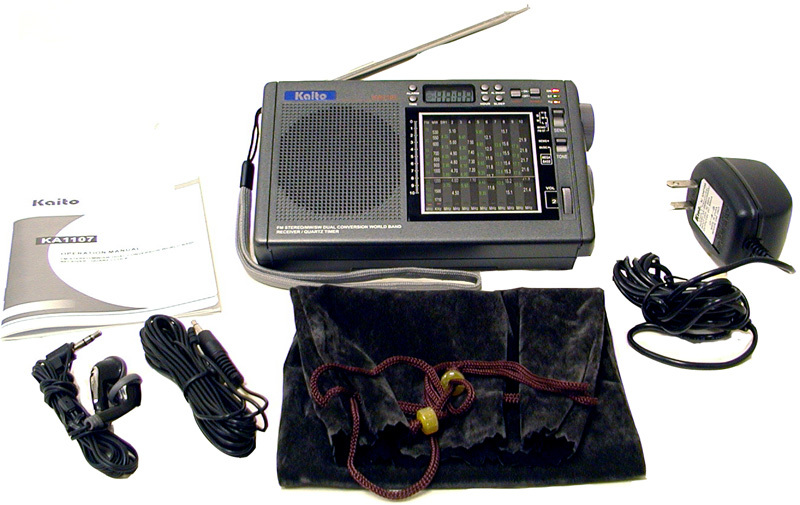 The KA1107 system includes: AC adapter, cloth carry pouch, external wire antenna, wrist strap and stereo earbuds. Gray cabinet. 7 x 4 x 1.25 inches. One year limited mfg. warranty. Please note that the box may say black, but it really is dark grey. Copyright 2006-2014 Universal Radio, Inc.